This is about as good as it gets with insect pests: neatly nibbling interesting designs on an unwanted plant. UPDATE: Thanks to Mary Schier's most recent post, I've learned that these leaves were cut by leafcutter bees. That should be easy to remember. 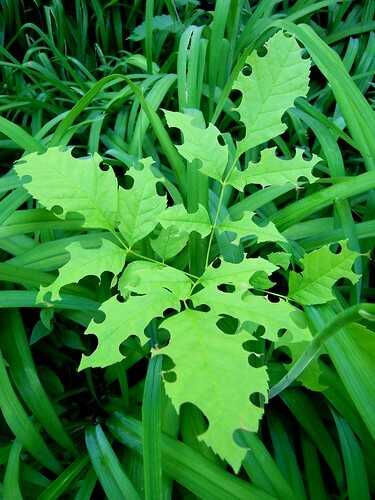 Here are a couple more articles about leafcutter bees: one written by an entomologist and one with some great photos. Oh, that is nice! Mine don't do nearly as well! Oh! That is so neat looking! Thanks, Peter ! I have a couple serviceberries in my little "nursery" bed that have very similar chomp marks and I had no idea. Now I do ! Cool ! I love to feed a diverse & motley crew of insects.